WASHINGTON (CNN) -- President Obama on Thursday called the nation's latest unemployment figures sobering, but said the economic recession is slowing. President Obama talks about job creation during remarks about the economy Thursday. In a Rose Garden appearance with chief executives of clean-energy companies, Obama noted the average number of job losses in the current fiscal quarter has been 400,000 a month, compared with a monthly average of 700,000 in the previous quarter. "It took years for us to get into this mess, and it'll take more than a few months to get out," Obama said. A government report Thursday showed a net loss of 467,000 jobs in June, compared with a revised loss of 322,000 jobs in May. It was the first time in four months that the number of jobs lost rose from the prior month. The June job losses also were far worse than the forecast of a loss of 365,000 jobs by economists surveyed by Briefing.com. The unemployment rate rose for the ninth straight month, climbing to 9.5 percent from 9.4 percent, and hitting another 26-year high. Economists had been expecting the unemployment rate to hit 9.6 percent. The only good news reported by the Labor Department on Thursday was that the number of workers filing initial jobless claims fell to 614,000 last week from 630,000 the week before. That was roughly in line with forecasts. Also Thursday, a new national poll indicated that nearly half of all Americans think the economy has stabilized, but only one in eight think a recovery has started. At the same time, the CNN/Opinion Research Corporation survey found that about 40 percent of respondents think the downturn is continuing. "The prevailing view? We're in a stall," said Bill Schneider, CNN senior political analyst. Still, one in five questioned said the economic conditions in the country today are good, up 9 points from March. 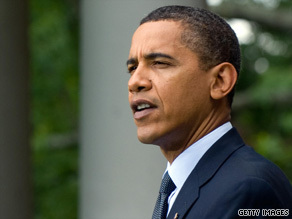 Obama has said recovery will take time, predicting the unemployment rate will climb above 10 percent before reversing. He insists that the economic stimulus package his administration pushed through Congress earlier this year has lessened the harm of the recession. The U.S. House last week passed its version of a new energy bill that would reduce greenhouse gas emissions causing climate change and promote renewable energy sources and energy efficiency measures. Obama said the bill "holds the promise of millions of new jobs ... that can't be outsourced." "We know we're going to have to change how we use energy," he said. "We are not folks who are scared of the future and look backwards." The latest job figures show job creation is necessary. Overall, nearly 3.4 million jobs have been lost during the first half of 2009, exceeding the 3.1 million lost in all of 2008. "It's not the catastrophic numbers we saw earlier this year, but they're still pretty ... lousy," said Keith Hembre, chief economist with First American Funds. The job losses don't tell the full picture of the labor market's pain. The average hourly work week fell to 33 hours from 33.1 hours in May, a record low in readings that date back to 1964. Average hourly wages were unchanged, so the shorter week shaved $1.85, or 0.3 percent, off of the average weekly paycheck. The so-called underemployment rate, which counts those who are working part-time jobs because they can't find a full-time position, as well as discouraged job seekers who have stopped looking for work, rose to a record high 16.5 percent. Those who have been out of work for six months or more, and thus have run out of unemployment benefits, climbed to nearly 4.4 million, also a record high. Tig Gilliam, chief executive officer of Adecco Group North America, a unit of the world's largest employment staffing firm, said continued sluggish spending by consumers is delaying the chances for an economic recovery. "The 90.5 percent who have jobs aren't spending," Gilliam said. The CNN/Opinion Research Corporation poll was conducted Friday through Sunday, with 1,026 adult Americans questioned by telephone. The survey's sampling error is plus or minus 3 percentage points. CNN's Chris Isidore and Paul Steinhauser contributed to this report.